New research in the US has revealed that endocrine-disrupting chemicals (EDCs) in a horse’s environment may play a role in the development of equine metabolic syndrome (EMS). Equine metabolic syndrome, which has no cure, is characterized by endocrine abnormalities in horses and ponies. Affected horses and ponies have a tendency to develop pockets of fat and/or become obese, and they have altered insulin dynamics. EMS also is one of the most common causes of laminitis, a painful and debilitating inflammation of tissue in a horse’s hooves, leading to reduced performance, and in severe cases necessitating euthanasia. The team concluded that accumulation of EDCs may explain some environmental variance seen in horses with EMS, but the precise role and dose response to EDCs in horses with EMS is not clear. The research by Morris Animal Foundation-funded researchers at the University of Minnesota, could explain some of the variability in EMS severity that can’t be explained by other commonly measured factors, such as diet, exercise and season. Dr Molly McCue, Professor and interim Associate Dean of Research in the College of Veterinary Medicine, described the findings published in the March issue Chemosphere as a “pivotal piece of a very complicated jigsaw puzzle”. “There are a lot of horse owners out there who are very diligent about providing their horses fantastic care, but the horse is still diagnosed. “It’s important to be aware that these chemicals contribute to the problem, so we can look for ways to reduce horses’ exposure to them,” McCue said. The team of researchers from Minnesota, The Netherlands, and New Zealand, studied more than 300 horses, from 32 farms, in the United States and Canada. They focused on Welsh ponies and Morgan horses, as these breeds are more likely to develop EMS than others. The team collected data on the horses’ lifestyles, including diet, exercise and past illnesses, as well as their farm location. This is the first study to examine associations between EDCs and disease in domestic animals. McCue said it remains to be seen how significant the association is, but hopes future studies will further scientific understanding and help advance veterinary care for horses. try Triple crown “naturals” pellet or you can use McCaulleys M10, balancer .. both are soy free.. Yes, everything is organic in Modesto Mills. Oats and black oil sunflowers are now being routinely sprayed with desicants about 2 weeks prior to harvest. Glyphosphate (Roundup) is being used routinely on oats, wheat, peas, beans, sugar beets and other crops that are not GMO. They desicate the plant, bringing all the field to ripeness, causing larger seeds as the plants die, and killing the bind weed that causes problems for the harvesters. Black oil sunflower seeds are sprayed with pesticides through the growing season. Horse owners are realizing that beets are grown in soil that gets sprayed with pesticides and gylphosphates year after year. My brother is a crop duster and spends most of his time in South Dakota spraying Roundup on weeds before planting wheat and then the wheat prior to harvest. He also sprays pesticides during growing season and finally a different desicant on black oil sunflower plants. Know what you’re feeding your horse. Mine have had hay, hay pellets and supplements. But we have very rich grass which is a problem as well. Good for you. One horse here and she gets 3 types Jax in winter, grass in summer, anything needed I’ve given her renew gold. Haven’t heard any bad yet I do ? Coconut., or alfalfa, I’ll add in any humane grade greens horses can eat ! Do you have any tips how to balance my horse’s system? He has those fat pockets and I have started feeding crome, maitake mushrooms, hemp and cinnamon additionally to his mineral food. He lost a bit weight during winter, but not enough I think. Which parameters did you find out need to be balanced especially? Or is it different with every horse? Thank you so much for your answer. Feeding soy is not common in Germany. So my pony doesn’t get this anyway and grain has never been on our diet. He already gets different herbs to support his liver and kidneys (started again a week ago after a pause) and they are supposed to have a detox effect too. Dandilion and thistle are among them, as well as kelp but some others too of which I don’t know the English expressions. Ginkgo would be an idea. I had Jaogualan for some time which is supposed to have a quite similar effect. So I see, that I’m already doing much and just have to be more patient I guess. He’s much better than 5 months ago but I think could still improve more. Buying good quality herbs is no problem at all in Germany. And you can buy the homeopathic remedies very easily in online pharmacies here too. Evitex, equine challenge supplements, no grains only feed hay pellets, have your hay tested so you’re not feeding high sugar hay. No treats. Beat pulp is loaded with chemicals. If you want an organic complete hay pellet look at Wild fed. The amount in sugar in hay and grass has changed a lot since most of the grass contains sorts that are especially grown for feeding cows. They need more energy for producing milk. This has become a huge problem here in Germany. Much of the hay contains up to 10 or even 15 % of sugar, while most horses shouldn’t have more than 5 – 10%. the organic hay grown for the organic milk over here is 32% sugar and I am taking timothy, I bought a load of organic timothy from northern California, a rancher who raised beef cattle, my horses liked it too much so I sent the test in and could not believe it 32%! I phoned them and asked if they had ever had their hay tested, they had not, they came and got the hay – phew I dodged the bullet with that one! They are one of the most known for their beef no wonder! Do you know if there is a sort of hay with less sugar? Thimothy hay versus orchard grass hay? Timothy is lower than orchard grass generally. Some hay distributors will have tested low nsc hay at a higher price. It’s what I have been saying for years.Chemicals everywhere especially on crops .Farmers spray all the time.Horsefeeds ,humans food.Cancer is one in three people and there are so many sick horses.Something is going on and it’s got to be stopped!! I see this daily in my business – I do nutritional consulting for horses – not only are the Round Up Ready GMO hay but the GMO soy doing the damage – the bag feeds with all the soy or “vegetable protein” (aka soy) are raising the cortisol numbers – moving them to an organic feed and helping them to detox with herbs makes all the difference – one of my clients horses had an ACHT of 1,200 she was on a popular low starch low sugar feed took her off that and did a follow up ACHT two months later she was down to 34 – put her on the herbs and her numbers were normal in a months times. The IR / PPID / Metabolic horses are not just Morgan’s but across all breeds. Nutrition plays a key roll in getting their hormonal balance back and getting them back to health! Been saying this for years and hence developed a pesticide and herbicide free feed: Crypto Aero Wholefood Horse Feed. I have seen TB yearlings with IR…. 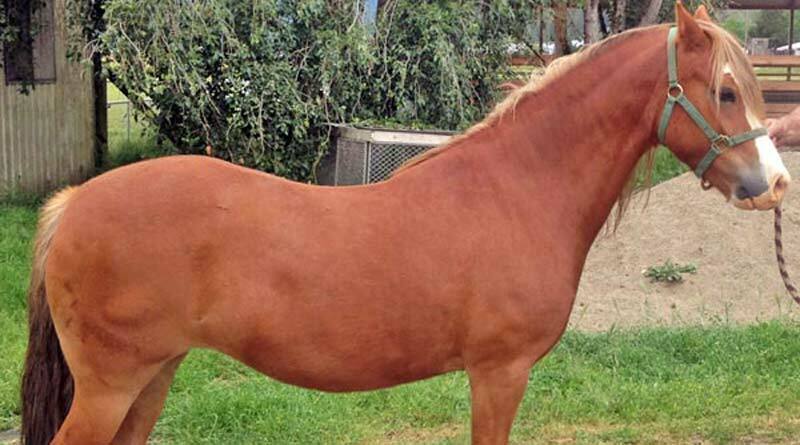 surely there is a genetic predisposition and we can’t ignore the steep increase of metabolically challenged horses across all breeds since the invention of processed feeds. I highly recommend Crypto Aero, I have had my IR horse on it for about 6 months and it’s made a huge difference, No soy or sugar at all!! That’s exactly why I started feeding Crypto Aero to my metabolic QH a few years ago. He hasn’t suffered a laminitic bout in over two years and is back to competing. Jessica Lynn is so right. Nutritional consultants for horses are often decades ahead of so many others. What is causing the imbalance of hormones and health issues in horses is not the hay or the soy, it is the GMO that is usually designed to be packed full of Round Up, or other harmful pesticides and chemicals. It is vital that humans and horses only consume GMO FREE food to maintain perfect health. Organically grown is always the best option. It has been said that once they stopped fertilizing with manure, they began to destroy health. (Cheval only uses GMO free ingredients and organically grows its most important ingredients in nutrient rich fields in SD fed only by rain, spring water, and manure. The only Cheval could assure perfect horse health was to go through the expense of raising and sowing their own vital ingredients.) The other thing that utterly ruins equine (and human) hormonal balance and health are thin, cheap plastic containers like water drinking bottles. BPA releases into food and water from these types of plastic causing havoc with hormones. Cheap, thin plastics surrounding water and supplements not only cause high levels of Xenoestrogens (the bad estrogens that cause cancer, etc. ), but all too often end up in our oceans causing huge problems to the precious ocean and life it houses. Eliminating GMO products and one time use plastics works wonders for health as well as for the planet. August you are so right on – I hate the plastic bottles everyone want to drink water out of these days, look what they are doing to our oceans as well – I refuse to buy water like that and have my own steel container I take with me! What about workers? Are they looking into those? You are 100% correct! Modesto millings source the foodstuffs from an organic farm in Canada with third-party testing. I talked to them. I used to use TC but when they changed mills here on the west coast all bets are off!